The professional Investment Property calculator will show how much you need to invest and how much capital gain you might get - up to four (4) investors. In addition, it allows you to to compare across different states. For example, if you want to know whether you should invest in NSW or QLD, you should use the Professional Property Investment Calculator as you can estimate properties in any of the following states: ACT, NSW, NT, QLD, SA, TAS, VIC, WA. You will get $99.98 FREE bonus (see the table below) when you purchase the Professional Investment Property Calculator. The Professional Investment Property Calculator has the optional ability to estimate Principal Place of Residence (PPOR) property and National Rental Affordability Scheme (NRAS) investment property. You only need to purchase a PPOR & NRAS Unlock Code to unlock these functions and it only costs you $9.99 for your personal use. For commercial use, you only need to pay $19.99 to get the PPOR & NRAS Unlock Code. Please note: You need to purchase the Professional Investment Property Calculator first before you purchase the PPOR & NRAS Unlock Code OR you can purchase the Professional Package which includes the Professional Investment Property Calculator and the PPOR & NRAS Unlock Code. Here is a screen shot that will give you a better idea that what you need to do and what this professional property calculator can do for you. This calculator is built in Microsoft Excel worksheet. You need to have Microsoft Excel 2000-2010 and Microsoft Windows to use it. It also works with Microsoft Excel 2011 on a Mac. Scroll down to see more screen shots of the Professional Investment Property Calculator This Professional Investment Property Calculator give you much more information on costs etc that the Free and standard version does not. 1. It allows you to simulate up to four people to co-invest on one property. It also shows the weekly cost and the future ROI for each individual investor. 2. It predicts up to 30 years cash flow of both pre-tax and after-tax. 3. It estimates property market value for future 30 years based on the capital growth rate that you set. 4. It allows you to switch between "interest only" and "interest + principal" home loan. 5. It calculates who pays for your investment property and how much on a weekly basis - from year 1 to year 30. Charts are included to illustrate the percentages. 6. It automatically calculates the income tax before and after deductions. 7. It automatically populates all the government tax, duties, and the capital works deductions (construction cost depreciation). 8. It will clearly tell you whether the investment property you want to purchase is a negative gearing one or a positive cash-flow property. 9. It allows you to compare across different states. For example, if you want to know whether you should invest in New South Wales or Queensland, you should use the Professional Property Investment Calculator. 10. It allows you to define different capital growth rates (property appreciation rates) when comparing across different states. For example, you may find if the property appreciation rates for NSW and WA are 5% and 6% respectively, it might be wise to invest in WA but not NSW. The Professional version has a special Client Report section which is only available for Commercial Use. View the sample Client Report of Property Investment Analysis. Please note: All the investment property calculators (Free version, Standard version, Professional version, or Ultimate version) have the same set of following assumptions. (1) It is assumed the investor has an interest only (unless otherwise stated) home loan and the interest is deductible for tax purposes. (2) When calculating the Capital Works Deductions, it assumes that the construction of the property started after 15 September 1987 and therefore the depreciation deduction is claimed for 40 years from the date construction was completed at a rate of 2.5% per year. Please note: You can manually adjust the depreciation deduction values from year to year if this assumption does not suit your situation. (3) When calculating the tax payables, the tax rates applicable to Australian residents are used and the 1.5% Medicare Levy based on the individual Medicare Levy threshold is included where applicable. The calculator does not incorporate any other factors that might influence the amount of tax payable, such as Medicare levy surcharge, HECS contributions, any rebates, and deductions. (4) The discount method is used to calculate capital gain tax if you hold the property for at least 12 months. The discount percentage is 50%. (5) All months are assumed to be of equal length. One year is assumed to contain exactly 52 weeks or 26 fortnights. This implicitly assumes that a year has 364 days rather than the actual 365 or 366. Disclaimer: All the Investment Property Calculators are built for residential properties but not commercial properties. 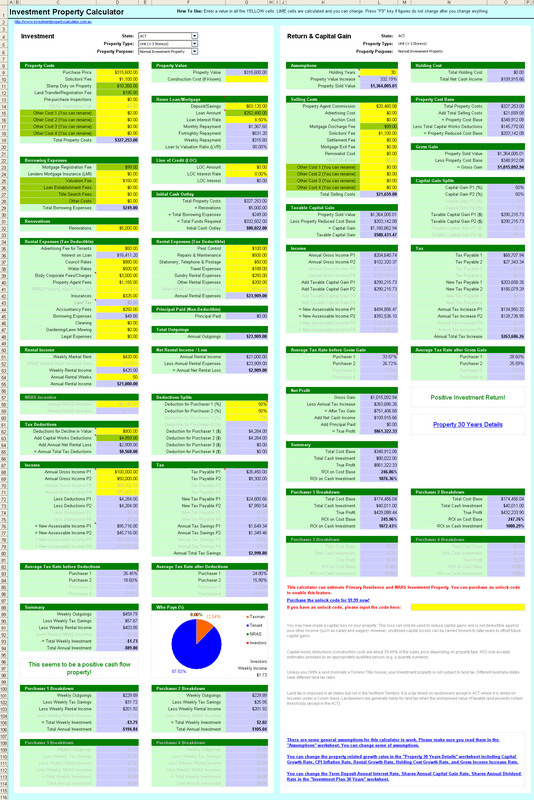 Using the Investment Property Calculators for commercial property investment (e.g. retail shop, office etc) is at your own risk. Refund Policy: If you are having issues with a product and need assistance with downloading and/or using the product, please contact us or visit Support Forums before you ask for a refund as we are confident that we will be able to resolve the issues. If we cannot help you, full refund will be offered within 30 days from the date of purchase. Investment Property Calculator will do our best to satisfy all refund requests from customers in a courteous, timely, and fair manner. Again, it will be very much appreciated if you can let us to rectify any issues you are having before asking for a refund. Personal Use is Non-Commercial use by you for your own private use on your own personal computer. 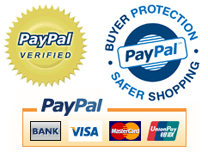 The Calculator or a download link will be sent to you via email once you make the payment. Please do check your junk mail before contacting me. Commercial Use is any use in which a corporation or business or commercial entity derives or attempts to derive monetary gain and benefit from or for any third party, either directly or indirectly, from the use of the Calculator. This includes Government and Military entities, corporations, LLCs, sole-proprietorships, sole traders, home-based businesses, and internet-based businesses. Free update and customization bonuses are included in the Commercial Use price. If you are having issues with a product and need assistance with downloading and/or using the product, please contact us or visit Support Forums before you ask for a refund as we are confident that we will be able to resolve the issues. If we cannot help you, full refund will be offered within 30 days from the date of purchase. Investment Property Calculator will do our best to satisfy all refund requests from customers in a courteous, timely, and fair manner. Again, it will be very much appreciated if you can let us to rectify any issues you are having before asking for a refund. Please use the Contact Form if you have questions. 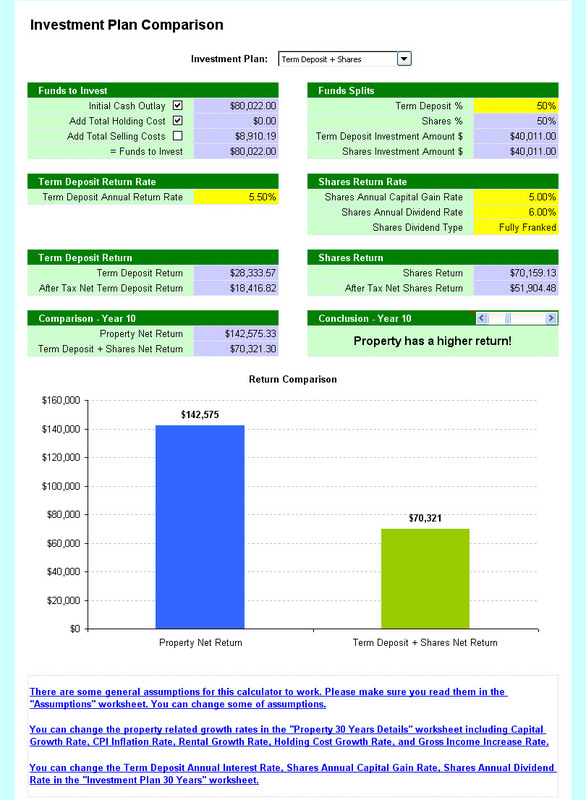 Investment Property Calculator does not provide investment advice. You should consider your own financial situation, particular needs and investment objectives and seek professional advice before acting on any of the information available on this website. Please read & accept our Terms & Conditions. By using this website you are deemed to accept the Terms & Conditions.